West Ham fell to Leicester City today 1-0 during a New Year’s Eve match at the King Power Stadium. The lone goal was a first-half header as Marc Albrighton’s cross from the right was headed back across goal by Islam Slimani to put the Foxes 1-0 up early in the match. West Ham’s opening 30 minutes of play featured sloppy passing and a lack of attacking creativity. In the second half the Hammers were the better side, but Claudio Ranieri’s defenders played smart and aggressively, and preserved the clean sheet for the defending Premier League champions. For Slaven Bilic’s team it was their first defeat in almost a month, as they had taken ten points over two weeks to climb out of relegation danger. It was Leicester’s second victory of December. Once the Hammers shook off the slow start they had some opportunities. In the 37th Danny Simpson blocked Antonio’s shot, and the ball spun wide but Kasper Schmeichel saved Dimriti Payet’s shot with his leg. Moments later the crossbar saved the Foxes as an Antonio strike was deflected off the frame. The post contributed to West Ham’s first half defending as well. 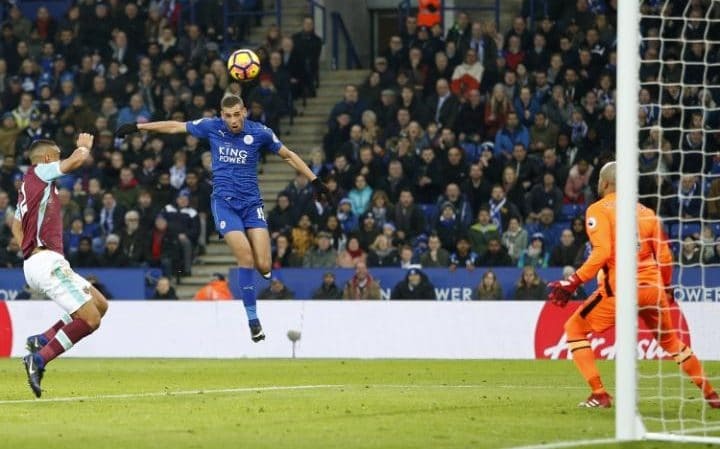 In the opening minutes of the match Albrighton crossed to Slimani who headed it into the nearside post, only moments before the duo would hook up for the game-deciding goal. The second half saw West Ham throw a lot of effort into seeking the equaliser, but Leicester played stout defending. West Ham’s best opportunity was an 85th minute header by Andy Carroll that barely missed wide of the upright. West Ham’s set pieces, typically a specialty of this club, were largely ineffective and unimaginative. Numerous Payet corners and free kicks went straight to Schmeichel or missed altogether. The hardest working man on the pitch could have been referee, Anthony Taylor, who booked eight players in a spirited match. Six minutes of stoppage time were added at the end, but West Ham failed to give the home side much threat in that time as they burned through the clock and secured a final victory of the greatest year in Leicester’s history. For West Ham, their reward is a two-day rest before hosting Manchester United on Monday. After enduring a physical 90 minutes in Leicester any expectations for the next match should be tempered. Mark Noble left the match early in the second half with a knee injury, and Carroll, Payet, and Antonio put in a long day. Lacking the depth that United possess, Bilic will need to be very creative with his substitutions. Strangely Pedro Obiang didn’t enter today’s game, even after Noble’s injury. Question as to whether he is injured or fallen out of favor with his gaffer. West Ham needs 18 points out of a possible 57 to reach the assumed safety of 40 points in the Premier League. In a year that began with much promise, a new stadium, and European football, this statement shows the disappointing start to the campaign, but a fit squad and a good run could move the club securely into the top half of the table by springtime. It would now be unlikely that Bilic will field a strong side for his Manchester City FA Cup tie on January 6. After this challenging first week of January hopefully the supporters in East London will see better times again as the schedule is a bit more forgiving the rest of January.